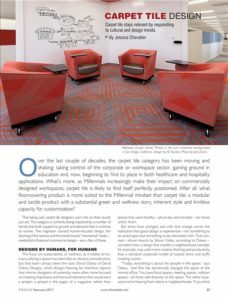 March 2017 - ID Studios, Inc.
Pictures of Lytx, an ID Studios project, were featured in Floor Focus’s February issue. Check it out! Over the last couple of decades, the carpet tile category has been moving and shaking: taking control of the corporate or workspace sector, gaining ground in education and, now, beginning to find its place in both healthcare and hospitality applications. What’s more, as Millennials increasingly make their impact on commercially designed workspaces, carpet tile is likely to find itself perfectly positioned. After all, what floorcovering product is more suited to the Millennial mindset than carpet tile: a modular and tactile product with substantial green and wellness story, inherent style and limitless capacity for customization.